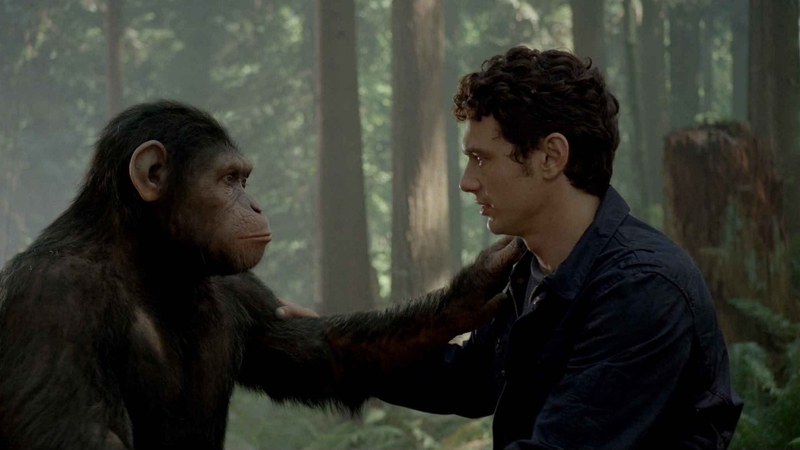 A conflict in messaging reduces this film to a simple tale of man and ape. An enjoyable piece of entertainment that falls short of greatness. On the surface, characters stating themes seems to achieve the goal of communicating meaning to an audience. However, a more effective means calls for an Author to actually show that theme in action. When Authors prove that what they’re trying to say actually works, the intended message becomes a part of the Audience’s psychology instead of simply a thoughtful fortune cookie message. Hot girlfriend Caroline Aranha (Freida Pinto) tells us early on that “some things aren’t meant to be changed” but it only applies to the substory surrounding Will Rodman (James Franco) and his ailing father. The authors prove quite the opposite with the main story. Featuring chimp Ceaser in the Main Character role, change—or evolution if you will—brings great happiness to those locked in cages. In an effort to show empathy towards Ceaser’s plight, the Authors end up with two competing stories—two conflicting messages. Are some things not meant to be changed or are they? Rodman shuns it, Ceaser embraces it. Both win out—so what exactly is being said here? As a result, the story as a whole means nothing. Rise of the Planet of the Apes tells a tale, not a story. This happened, then this happened, then this happened. And then it ended. Nothing more than what appears on-screen. The lack of a compelling emotional argument in either the main story of substory leaves one feeling cold and fulfilled. Still, the pacing maintains interest, the callbacks to the original delight, and the film begs for a sequel. Definitely one to see, just don’t expect more than a really great yarn.